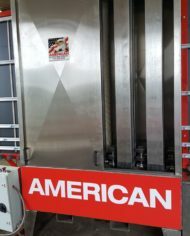 American stainless steel vertical open top flat glass washers manufactured by American Glass Machinery in Finleyville, PA are the finest vertical washers made. There are over 90 of them throughout the world. All the parts are made in America. Electrical parts are UL approved and made in America and can easily be obtained from your local electrical supply store. We offer an unprecedented 2 year warranty. 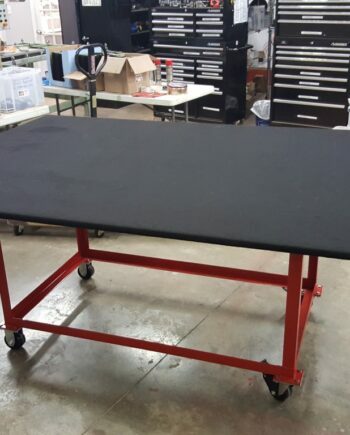 The open top design can be manufactured as a 24″; 36″; 48″; 60″; and 72″. 84″, and 96″ models are closed top designs. Washers can be made with 2, 4, 6, or 8 brushes. Standard brushes are low-e brushes and come in 12″ segments stacked on solid stainless steel brush shafts that can be rotated for wear. 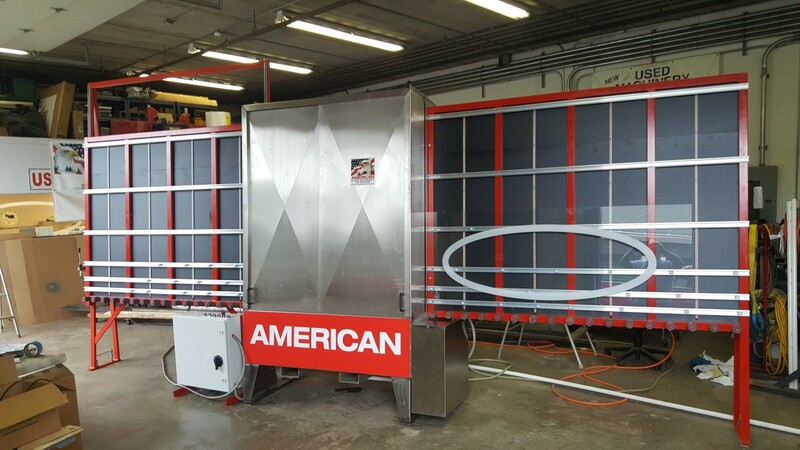 The washer cabinet is made out of heavy duty stainless steel with 4 stainless steel sliding doors that can be lifted out completely for total access to the interior of the washer. 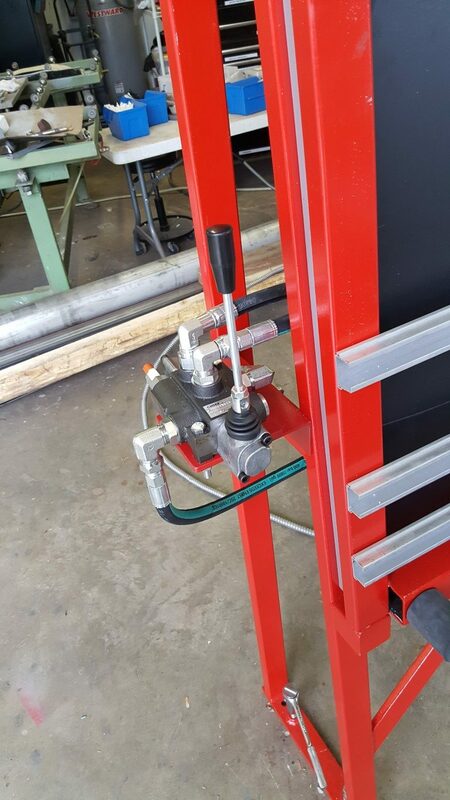 The working height, or pass line, is a comfortable 30″ off the floor. 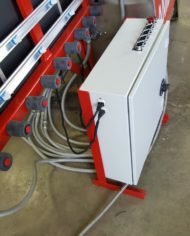 (the washer can be manufactured with lower pass lines to match Peter Lisec or Lenhart or Bystronic or other insulating glass lines). 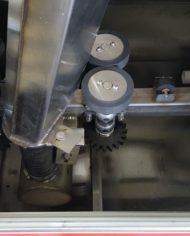 Individual stainless steel covers with rubber squeegees contain the water in the detergent brush section, the rinse brush section and the spray rinse section. 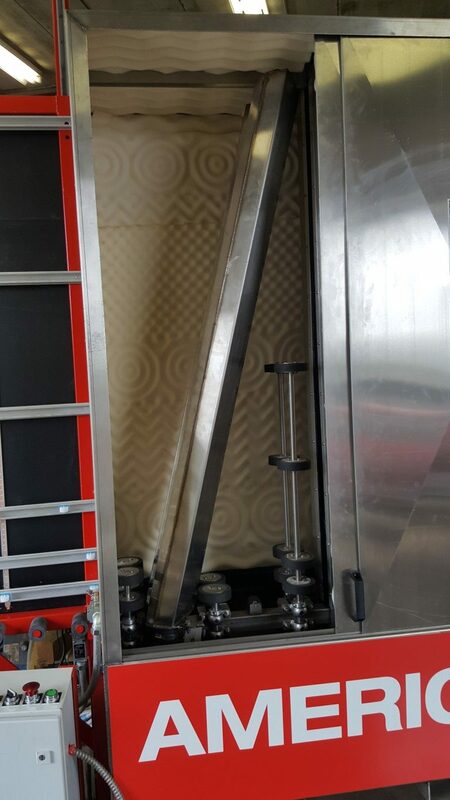 The drying section is protected with sound insulation material. 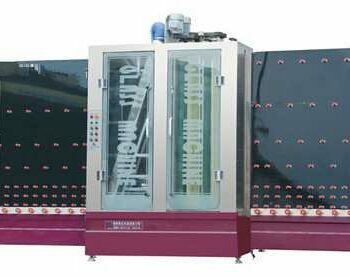 Specially designed stainless steel tear drop high pressure air knives are used to dry the glass. The blower can also be equipped with our special filter/silencer which reduces the decibel level of the washer close to 70 which is well below the acceptable limit of 90 decibels in 8-hours of exposure. 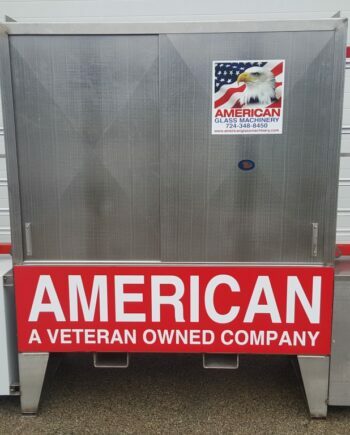 The water tank is made of heavy duty stainless steel and is an integral part of the washer cabinet. It is not separate from the main body. 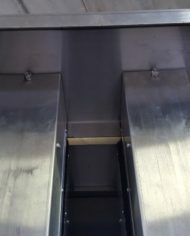 It is directly under the conveyor inside the washer cabinet. 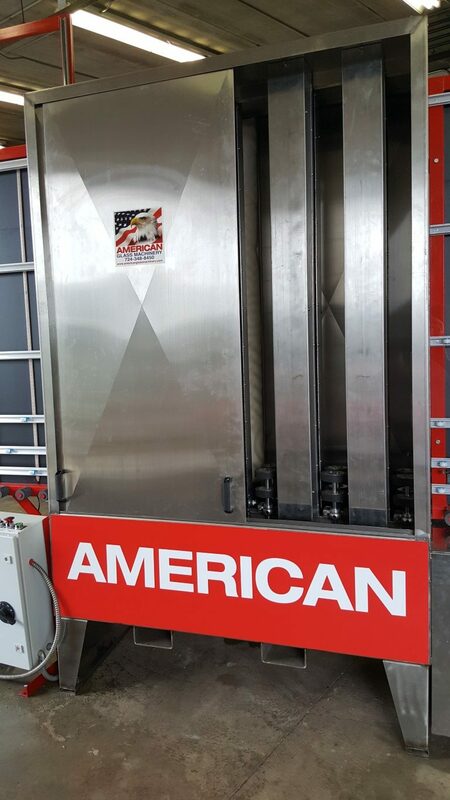 The water in the detergent wash section is heated with an immersion water heater controlled with a thermostat and is protected with a low water level safety device. This water is recirculated with a stainless steel water pump. Water level in this section is maintained automatically with a float valve. And constantly replenished with clean water draining from the final fresh water rinse. 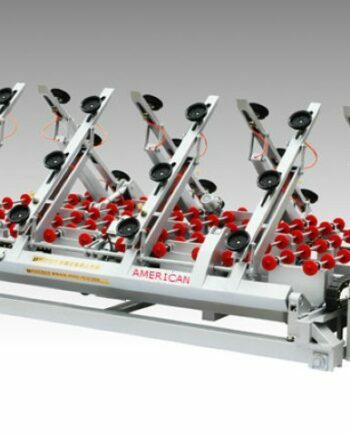 The final rinse is a spray rinse coming directly from plant water or from a deionized system. The washer is automatically fitted to run deionized water. There is a solenoid water valve that shuts off the fresh water rinse if there is no glass in the washer thus reducing the water consumption to as low as ¾ gal per minute. Water consumption without this device is 1 ½ gallons per minute. 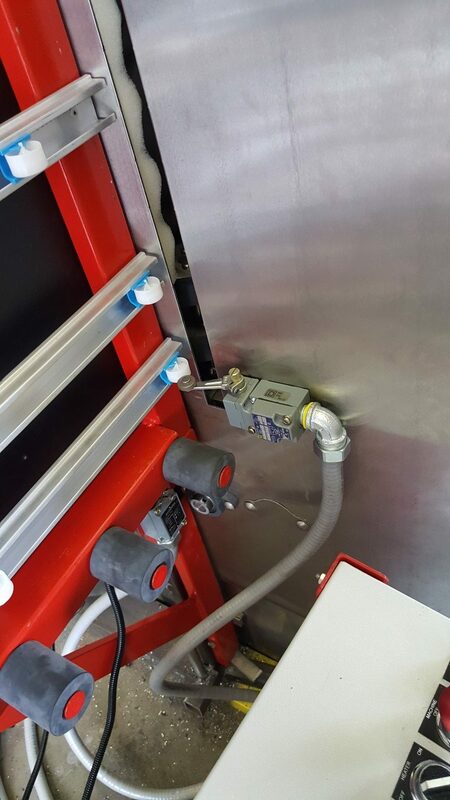 All the water lines inside the washer cabinet are outfitted with quick disconnect fittings for ease of maintenance. The bearings are non-lube stainless steel bearings in a Delran non corrosive pillow block. 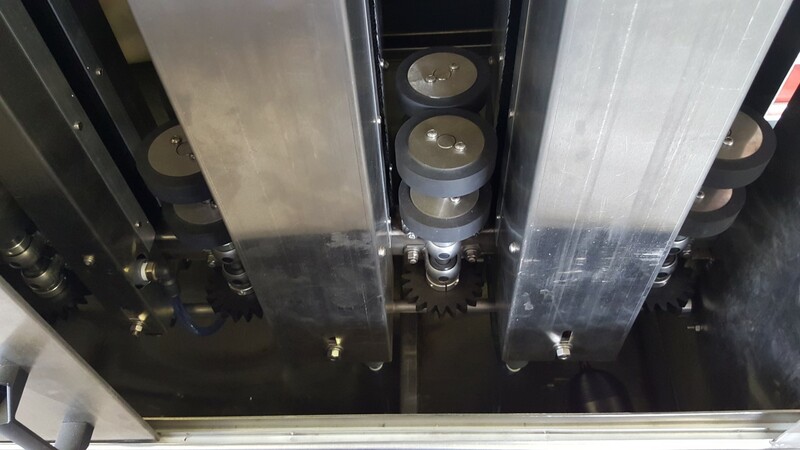 The gears are non-lube Delran gears for quiet, smooth, maintenance-free operation. 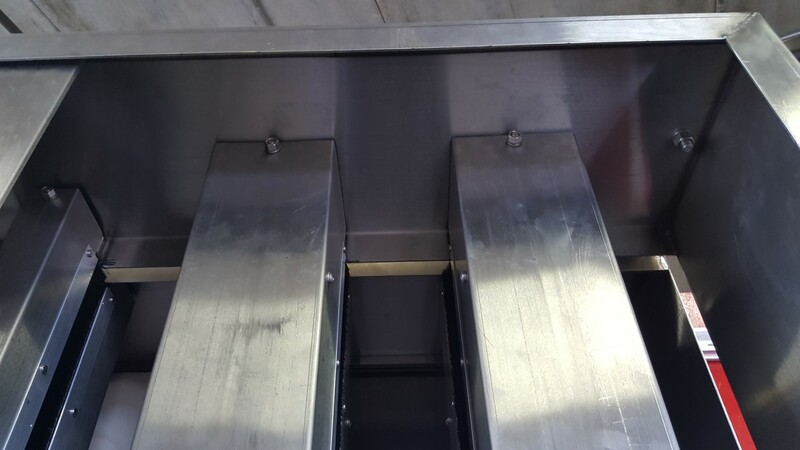 Inside the stainless steel washer cabinet the conveyor wheels that support the bottom edge of the glass are mounted on stainless steel brackets and are easily removed for maintenance. No tools required. 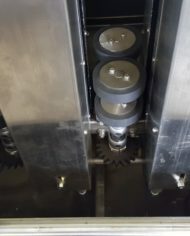 The conveyor wheels outside the washer are also easily removed for maintenance. 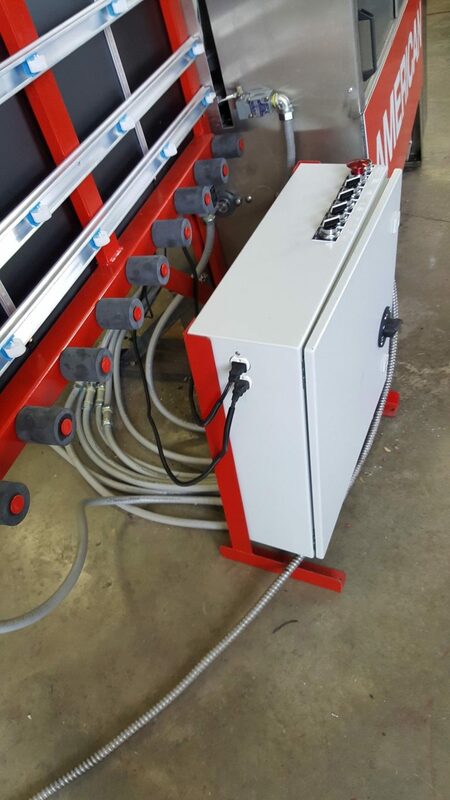 All the motors are easily accessible for maintenance and are located outside the washer—away from water and steam. The blower is a heavy duty high pressure blower mounted on the floor behind the washer. 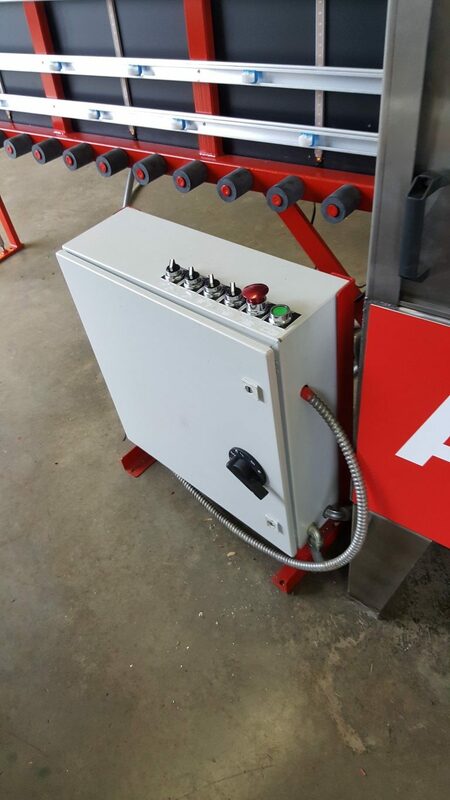 The electrical control panel is a watertight panel conveniently located on the front of the washer cabinet. 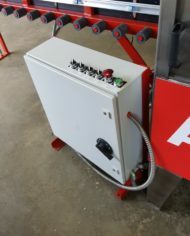 The panel is equipped with a safety lock that shuts off electrical power to the inside of the panel when the panel door is opened. It is built with heavy duty UL-approved electronic parts which are readily available worldwide. The electrical schematics and installation and operating instructions are safely stored in a pocket inside the control panel. The electrical conduit is also watertight. This washer also comes with an optional heavy duty light package with a black metal background that makes it easy to inspect the lights of glass for cleanliness and imperfections. This panel is easily plugged into the main washer cabinet. Replacement fluorescent bulbs are readily available from your local hardware store. 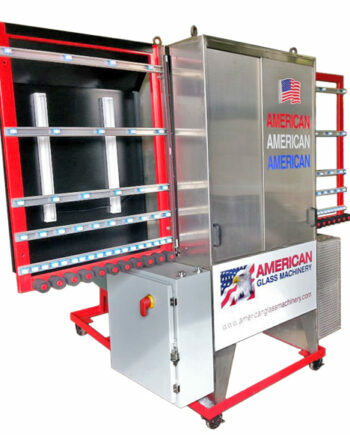 This washer will wash flat glass in thicknesses from 1/32” to 1/2″ without any adjustment. Minimum glass size is 2” x 10” in length. 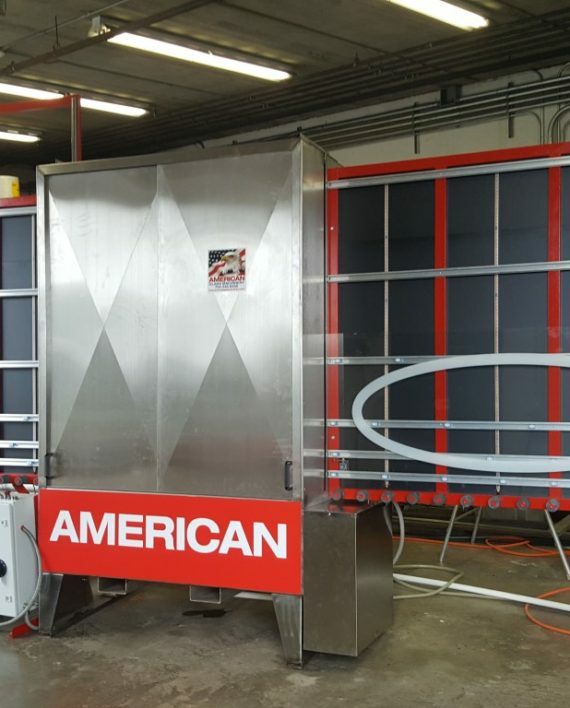 Since this washer has an open top it will wash glass twice the height it is designed for. 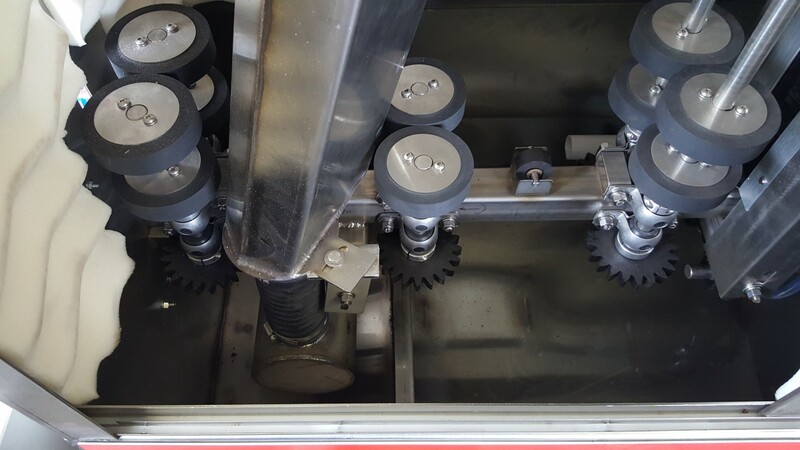 (We also make a special mini stainless steel vertical open top flat glass washer that will wash glass as small as 2″ x 5 1/2″). 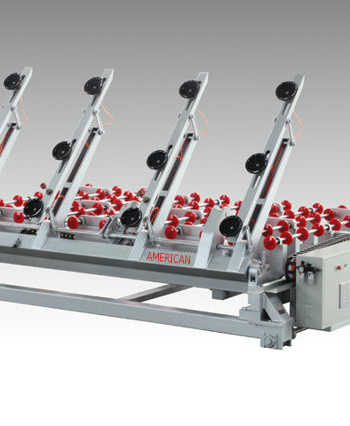 The washer arrives at your factory in 4 pieces; the main washer cabinet, 2 conveyors and the blower. 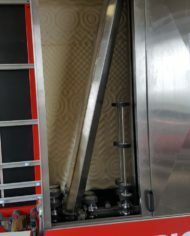 Once the washer is properly aligned and installed the washer cabinet and the conveyors and the blower must be securely anchored to the floor for safety reasons. All that remains for installing the washer is for you to connect the electrical cable, a ½” water line and a 2” drain.